This one isn't meant to be profound... just more evidence of growing consumer trends that affect our industry. We already know that the landline telephone is dying a slow death in apartment buildings across the country. Many people have found digital phone and VoIP to be much cheaper and just as reliable. Then there are the millions of people who have dropped their landline entirely in favor of using their cell phone exclusively. Although this might look like your regular cordless phone, this new device from Panasonic uses the box pictured to connect to any Bluetooth-enabled cell phone. From the Panasonic website: "...there's a better way to make and receive calls at home with ultimate comfort and convenience. 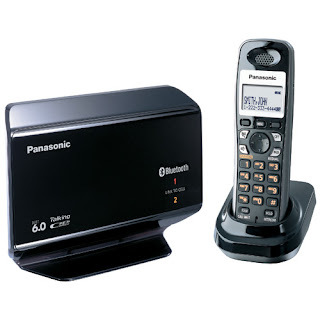 Panasonic Link-to-Cell uses Bluetooth® technology to connect your cell calls to your home handset. No more running for your cell, walking around for good reception, or cradling that little phone on your shoulder." Supposedly, once you successfully link the system to your cell phone, from then foward, the handsets will automatically connect to your cell phone as long as it's within 30' of the base unit. You can link up to two cell phones to the system, and your cell phone(s) can charge while using the handset. Caller ID and custom ring tones let you tell who is calling, and on which phone. Fixed-mobile convergence is making its way into many businesses, and there's a case to be made for it in the home (which potentially flips the landline argument on its side). But at least for now, the trend in the home is more bad news for the landline. Personally, I know I haven't used a landline since 1999 -- now with a device like this, it makes it even easier to avoid the landline and still get the phone service I expect.